I just planted my Chinese Lanterns and was I disappointed by the number of seeds in the packet. I had bought Wal-Mart Garden packets of seeds and they cost just as much as the other packets of seeds. But there were hardly any in there. I had dug out about 2 rows of 30" each for the seeds and it's starting to rain. Imagine my suprise when I only had enough seeds for a 15" stretch of one row. The best seeds I have ever bought was at Lowe's last year. They were zinnia seeds in a box mied with hummus or bone meal or something...anyway, there were a million seeds in that box and I had a HUGE zinnia patch by the house and a smaller one in the yard and seeds left over. I couldn't wait to get a box this year...but so far, they don't have them...and I threw away the box so I doneven kn what the company name was or anything...(not to bright). So, I broke down and bought seeds at Wal-mart....UGH...not even close! I feel your pain, as Clinton would say! Awhile back I found packs of seeds 10 for $1.00! Well, I bought a gazillion dollars worth of them! Well, no wonder they were ten cents each...not many seeds in them. But, for a dime apiece I guess I can't complain! Vanessa...next time you want Zinnia seeds LET ME KNOW! I have gallon milk jugs full of them! Very pretty .I love zinnias. Hey Vanessa,save your own seeds this year.It's really easy to do.Just ask the weirdo bird chick. Tammy ,I've still got lots of seeds left.If you want some.Just let me know.A seed is a really bad,bad thing to go to waste. I would love to have some more chinese lantern seeds but I don't have anything to trade. Oh those zinnias are WONDERFUL!!!! I dont know why, but they are one of my favorite flowers. I love having them in vases all around the house. Hope mine are that pretty this year! WOW THOSE ARE BEAUTIFUL CINDY!! 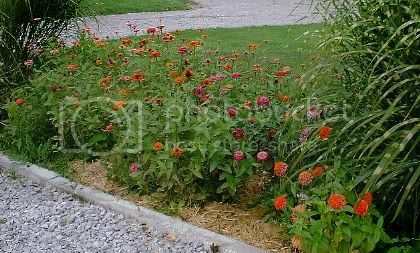 I've got a couple different types of zinnias and I'm gonna plant them tomorrow...I can't wait!! *~*Last night I played a blank tape at full blast. The mime next door went nuts.